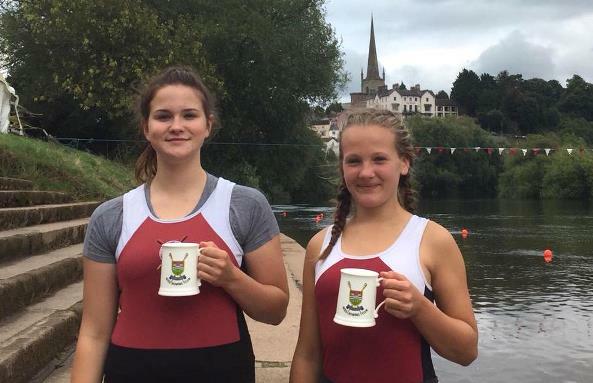 Stratford upon Avon Boat Club Junior 15, 16 and 18 year old squads were out in force over the weekend to enjoy their last regatta of the season in the beautiful setting of Ross on Wye. Run over a 750 meter downstream course with a deceptive bend and fast current, Ross rewards a high degree of skill in addition to strength. Stratford seized the day by winning three events before lunch. Fred Tyler and Joe Hodson won the Open Junior 16 Double Scull final controlling the race from the start and winning by one length. 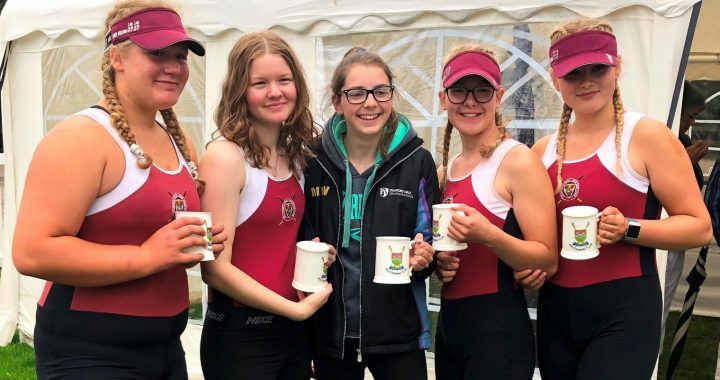 Alice Baines followed dominating the Women’s Junior 15 Single Scull event, beating Queens Park by over two lengths in the final to bag her first victory in a single. Competing in the same event Mili Wilcock won her first round by five lengths and only lost to Queens Park by a third of a length in spite of running aground due to the low water levels. A fine effort for her first event in a single scull. 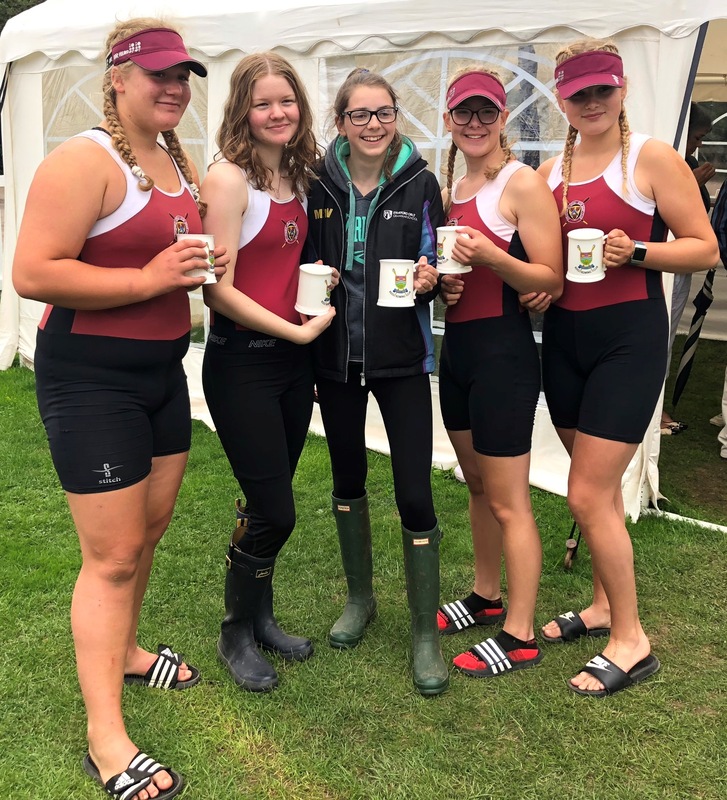 The third victory of the morning was delivered by the Women’s Junior 15 Quadruple Scull of Jasmine Mountney, Nixie Brunt, Maiya James and Mya Kenny, coxed by Matilda Watts. They beat City of Oxford in the final by two lengths. 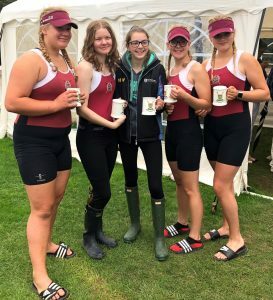 The Women’s Junior 16 Quadruple Scull crew of Hermione Hill, Emma Little, Jess Wiesheu, Khloe Curnock sculled brilliantly to comfortably win their semi-final by over a length, only to forfeit the race on a technicality. Katie Wellstead finished the morning racing with a superb display of sculling in the Women’s Junior 16 Single Scull semi-final. In one of the closest races of the day Katie lost by just one foot to the City of Bristol sculler, who went on to win the final easily. A total of three wins, and very close to two more – all before lunch. In the afternoon, most of the athletes switched boats to enter their second event, but winner’s trophies proved elusive. 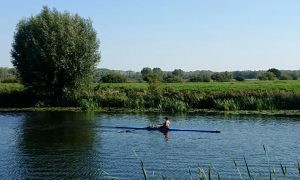 Joe Hodson came close, reaching the final of the Open Junior 16 Single Scull event, this time representing King Edward VI School, as did Fred Tyler in the Open Junior 15 event for Stratford, but neither could repeat their win in the double scull. Stratford entered two crews in the Open Junior 18 double sculls event. Dominic Furey and Harvey Mole put up a spirited performance to finish two lengths adrift of a very strong crew from Wycliffe who went on to beat the second Stratford crew, Howard Gould-Yates and Geoffrey Flambert, by a similar distance in the final. In their final row as Junior members of Stratford before moving to university Claire Teakle and Sofia Ward produced two excellent rows in the Womens’ Junior 18 double sculls event winning by a comfortable margin of three lengths against a crew from City of Bristol to make the final, where a home combination from Ross on Wye proved just too strong winning by two lengths. Coach Sam Hill summed up by saying “We have seen high quality sculling across the whole squad over the weekend and a great set of results against tough competition. It is very encouraging for the athletes to finish the season on such a high, as winter training approaches”. The J13’s also travelled to Ross with the J14’s on the Sunday of the weekend. It was a pretty wet day with the rain finally stopping at about 3pm. The J13’s didn’t let this stop them though. First up was the J13 doubles. Toby Sartain and Harry Trueman raced against a very strong duo from City of Bristol, followed by Tomi Wilcock and Will Beattie racing against Royal Chester. Despite both pairs putting in strong technical performances, neither were quick enough to beat their opposition. 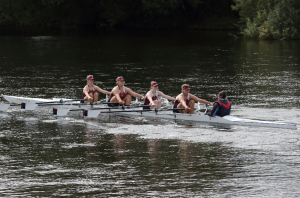 Next up was the J13 girls’ quad of Anne Mynors, Charlotte Syson, Fleur Griffiths, Freya Watts and Cox Harriet Holmes. Again another strong performance, leading when watching from the bank, were unfortunately beaten by another crew from City of Bristol, on the stagger at the finish. 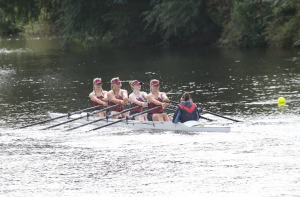 Honour Keil raced in a single for the first time against yet another City of Bristol sculler and fell to the same fate as the rest of her squad mates, losing by three and a half lengths. Having dried out and warmed up in cars, the afternoon was more promising. First up were the WJ13 doubles. Harriet Holmes and Freya Watts teamed up together and in an extremely close race, were just pipped to the line by a canvas by a strong City of Bristol pair. Honour Keil and Fleur Griffiths were up next and managed a fantastic performance to finally take a win against City of Bristol by four boat lengths. Their next race was against another Bristol crew where again the Stratford duo were victorious winning by one and a half lengths. In the final they came up against a crew from Queens Park High School. This was a race too far for the Stratford boat and with Keil carrying an injury they were beaten by the better crew on the day. Trueman, Beattie, Wilcock, Sartain and Cox Holmes joined forces to race in the J13 coxed quad. Again it was Bristol that they faced and the opposition were too much for the Stratford crew, despite putting up a strong fight they couldn’t get back on terms with another very strong Bristol crew. A wet wind and unfamiliar cold greeted the J14 squad at the Ross Juniors & Masters Sprint on Sunday. First on the water for the J14s was Conar Aitchison & William Clarke in the double event against Bristol. An excitingly close fought race in worsening rain eventually saw Bristol over the line first by a mere third of a length. Next to race were Amelie Sartain, Elisabeth Edwards and Sophie Elstone in the WJ14 singles. All three confidently won their heats and went through to the semi-finals with Amelie ultimately winning through to the final. Up against strong competition from Runcorn, Amelie controlled the race throughout to win the event and Stratford’s first ‘pot’ of the weekend. 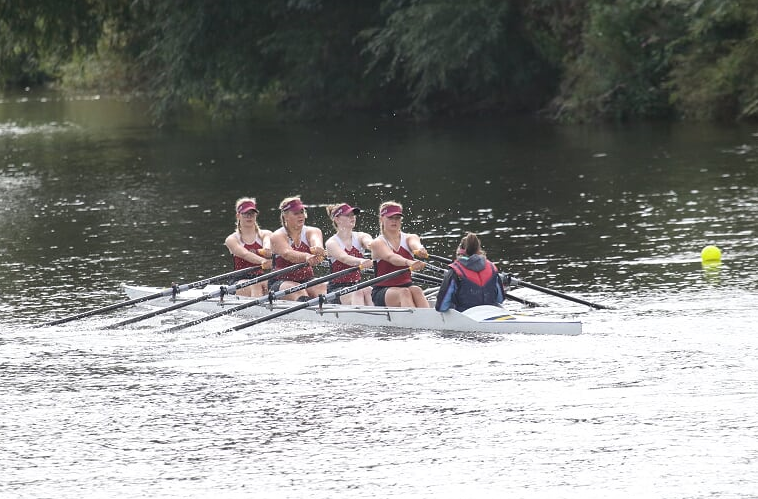 The morning’s racing continued with the WJ14 quad, consisting of Emma Harrison, Julia Zampronio Gurden, Martha Usselmann and Sienna Rawlings, coxed by Mary Walton, up against Royal Chester. A hard race in terrible weather conditions saw all the crew rowing bravely, losing out at the line by only two lengths. The afternoon started to see the rain ease off with the sun making an occasional appearance. This welcomed onto the water the two Stratford J14 girls’ doubles of Martha Usselmann and Sienna Rawlings and Amelie Sartain and Sophie Elstone. 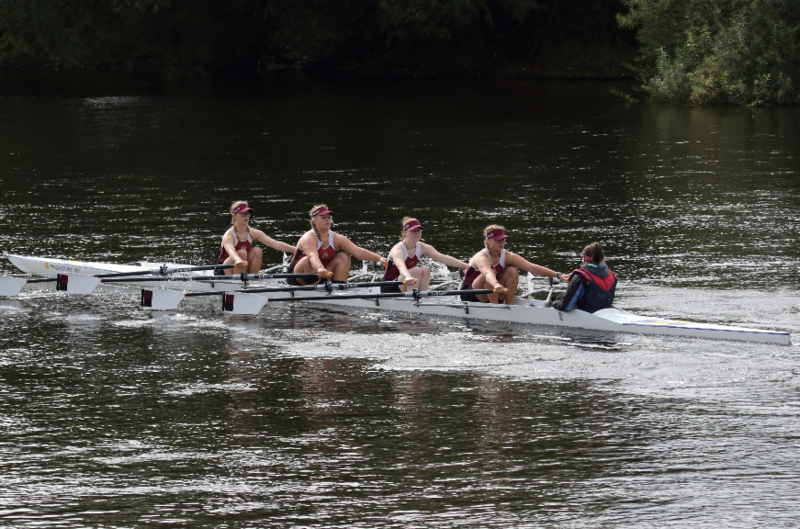 With nine crews in the event, both Stratford crews comfortably won through their heats before meeting in the final. At the line, tensions were high: a fast & furious start saw Amelie and Sophie take a slight lead into the bridge bend. Both crews through safely, a determined push from Martha and Sienna wasn’t quite enough to close the building gap in the sprint to the finish, with Amelie & Sophie crossing the line a couple of lengths ahead to win two more ‘pots’. 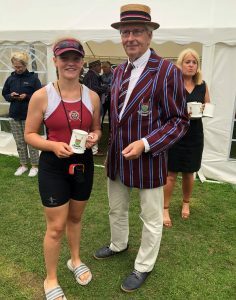 Stratford’s Kjersti Rogneflaten Woolley raced in composite crews with Derwent Rowing Club over the weekend. 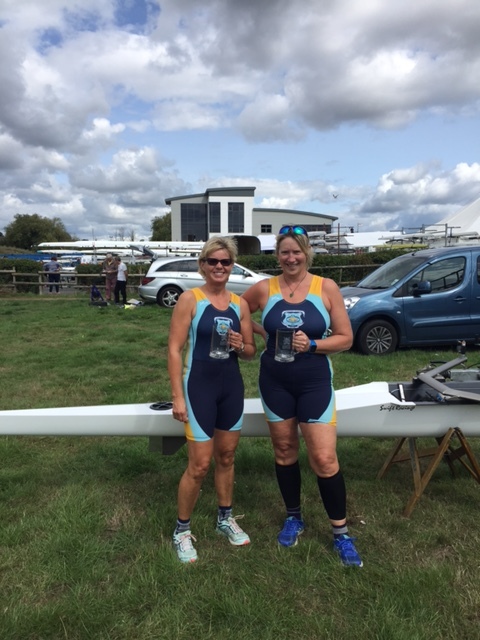 Saturday in Gloucester started with Women’s Master E double scull against Upton Rowing Club. 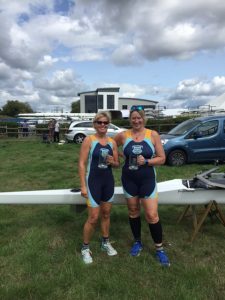 Kjersti and her partner Gillian Lockhart from Derwent had to give the Upton ladies a four second head start on the 600m course. A very exiting race, but with a great finish – split time of 1.59/500m – they won with half a boat length. Then Kjersti was up against a lady from Exeter RC in Women’s’ Masters F 1x. A mistake at the beginning of the race put Kjersti a boat length behind, which also was the finishing verdict. It was an exciting race for the spectators. 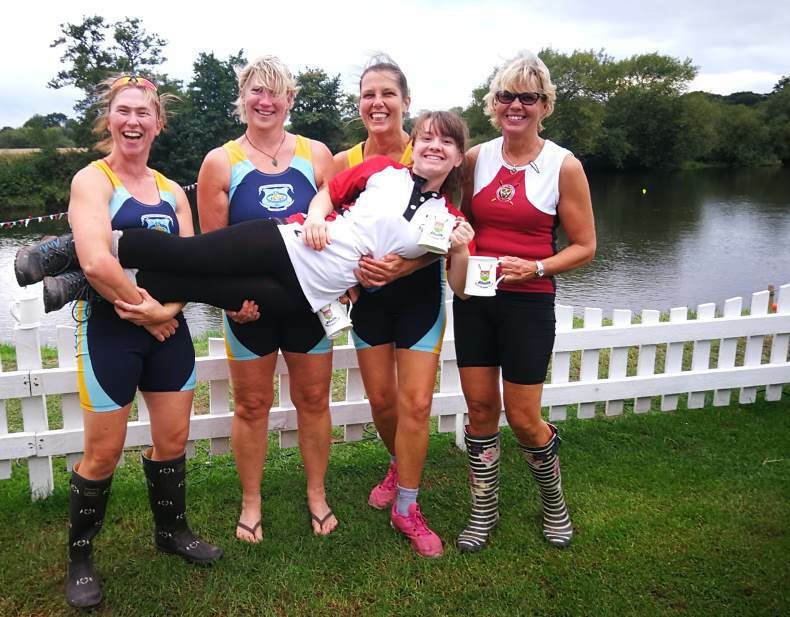 On Sunday at Ross on Wye the Stratford/Derwent Women’s’ Masters D coxed four took on Minerva Bath. It was another exciting close race, but with help from the excellent cox, Amie Jones from Stratford, Stratford was first over the finishing line. 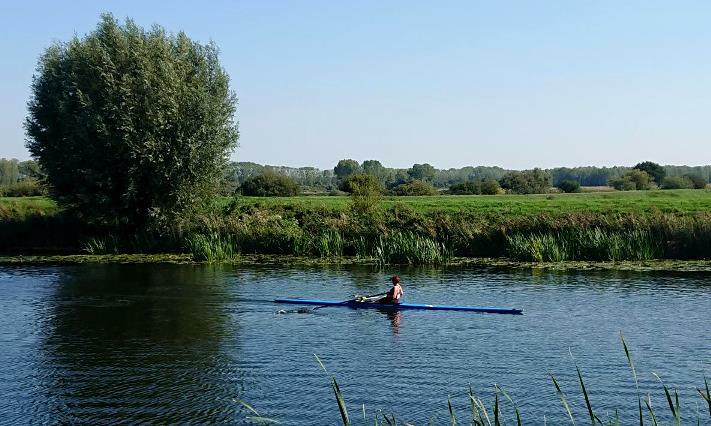 Christine Goodwin from the Senior Squad took part in the Great Ouse marathon 21.5km in the Women’s Masters D.1x category and finished in a time of two hours, eight minutes and six seconds. Posted in News and tagged Derwent, Gloucester, King Edward V1 School, Ouse, regatta, Ross on Wye, summer camps.